Born May 1, 1967 (some sources say 1966), in Delhi, Louisiana Tim McGraw is One of the most popular "Young Country" stars to emerge in the 1990s. Tim was raised mostly in the small town of Start, LA, near Monroe, and grew up listening to a variety of music: country, pop, rock, and R&B. He attended Northeast Louisiana University on a baseball scholarship, studying sports medicine, and it was only then that he started playing guitar to accompany his singing. He played the local club circuit and dropped out of school in 1989, heading to Nashville on the same day his hero Keith Whitley passed away. McGraw sang in Nashville clubs for a couple of years and landed a deal with Curb in 1992. His debut single, the minor hit "Welcome to the Club," was released later that year, and his self-titled debut album appeared in 1993 but failed to even make the charts. Things took a turn for the better with the lead single from his 1994 sophomore effort, Not a Moment Too Soon. "Indian Outlaw" was released. it reached the country Top Ten and even crossed over to the pop Top 20. All the publicity helped send McGraw's next single, the ballad "Don't Take the Girl," all the way to the top of the country charts; it too made the pop Top 20. The album kept spinning off hits: "Down on the Farm" hit number two, the title track went to number one in 1995, and the novelty tune "Refried Dreams" also reached the Top Five. Not a Moment Too Soon was a genuine blockbuster hit, eventually selling over five million copies and topping both the country and pop album charts; it was also the best-selling country album of the year. 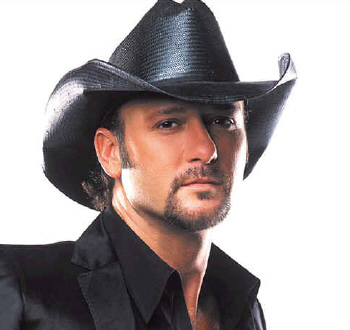 McGraw's follow-up, 1995's All I Want, immediately consolidated his stardom with the number one smash "I Like It, I Love It." The album topped the country charts, reached the pop Top Five, and sold over two million copies. Once again, it functioned as a hit factory thanks to the number two "Can't Be Really Gone," the number one "She Never Lets It Go to Her Heart," and the Top Five "All I Want Is a Life" and "Maybe We Should Just Sleep on It." His next album, 1997's Everywhere, become another crossover smash; it topped the country charts, fell one spot short of doing the same on the pop side, and sold four million copies. The lead single was a duet with his wife Faith Hill called "It's Your Love," which not only hit number one country, but made the pop Top Ten. Three more singles from the album -- "Everywhere," "Where the Green Grass Grows," and "Just to See You Smile" -- hit number one, and two others -- "One of These Days" and "For a Little While" -- reached number two. Meanwhile, "Just to Hear You Say That You Love Me," another husband-and-wife duet from Hill's 1998 album Faith, climbed into the Top Five. His next album, 1999's triple-platinum A Place in the Sun, hit number one country and pop, and four of its singles also hit number one: "Please Remember Me" (which featured Patty Loveless), "Something Like That," "My Best Friend," and "My Next Thirty Years." 2000 brought McGraw's first Greatest Hits compilation, a best-selling smash, and another Top Ten duet from Hill's Breathe album, "Let's Make Love." The song later won McGraw his first Grammy, for Best Country Vocal Collaboration. 2004's Live Like You Were Dying continued McGraw's record of commercial success. The title track, dedicated to his father Tug McGraw who died of a brain tumor earlier in the year, was a soaring ode to living life fully and in the moment, while the second single "Back When" was a paean to an easy nostalgia. 'Live Like You Were Dying' spent seven non-consecutive weeks at #1 on Billboard (10 weeks on Radio & Records) and went on to become the biggest hit single of the year. It also became one the most awarded songs/records by winning ACM Single and Song of the Year, CMA Single and Song of the Year and a Grammy. In April 2006 McGraw and wife Faith Hill began their 73-concert 55 city Soul2Soul II Tour 2006, again to strong commercial acceptance. The tour grossed nearly $89 million and sold almost 1.1 million tickets, making it the top grossing tour in the history of country music. It was named "Major Tour of the Year" by the prestigious Pollstar Magazine, beating out such heavyweights as Madonna and the Rolling Stones. In a special gesture, the couple donated all of the profits from their performance in New Orleans to Hurricane Katrina relief. In July 2008, Tim McGraw's sixth single, and the title track of his album, "Let It Go," was released to country radio. Following that, a seventh single, "Nothin' to Die For," entered the Country charts at 57 late December. Tim McGraw released his third greatest hits package, Greatest Hits 3 on October 7, 2008. In addition to singing, McGraw has ventured into acting, with a supporting role in the Billy Bob Thornton film Friday Night Lights, The Kingdom, a lead role in 2006's Flicka and a supporting role in Four Christmases with Vince Vaughn and Reese Witherspoon. He is also a minority owner of the Arena Football League's Nashville Kats.